Saint Paisios: Go away, and take your lies with you to the court room! – Christos anesti (Christ is risen)! Panagiotis cries out, and before long a man with a flowing beard is seen in the doorway. Father Arsenios greets his old friend warmly and the Norwegians politely, before telling a few of the numerous stories of signs and wonders which took place right here in his cabin. A phenomenon father Arsenios tells us about, is the ability of saint Paisios to know what the guests would ask him, before even opening their mouths. – Once, a lawyer came to Mount Athos. He didn’t believe the stories about Paisios, and decided to put him to the test. He planned to present himself as a doctor, instead of a lawyer. When he arrived at the gate he found himself in a group of 50 people who all had come to see the saint. Elder Paisios opened his door, looked the lawyer straight in the eye, and said: “Go away, and take your lies with you to the court room”. The man never doubted again, says father Arsenios. The kind of Christianity preserved on Athos has a rather unique history. 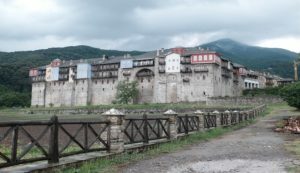 After the capitol of the Roman Empire fell to the occupying Muslim army in 1453, Mount Athos became the last remaining outpost of Imperium Romanum. Already in the year 972 it had been established as a self-governing monastic state within the empire by the emperor John 1 Tzmiskes. Today the «Autonomous Monastic State of the Holy Mountain» is the only republic where the banner of the Eastern Roman Empire – the characteristic double eagle – still can be seen waiving in the wind on top of official flag poles. Mount Athos is today considered to be the spiritual centre of the Orthodox Church. Over 2.000 monks reside in the 20 operative monasteries, having dedicated their lives to prayer for the entire world. –The monks find the reason behind their monastic calling in the words by Jesus Christ (Matthew 19) regarding a life of celibacy for the sake of the kingdom of God, about selling all belongings, giving to the poor, and following Christ, says father Johannes, the priest in St. Nicholas Orthodox Church in Norway, as well as the spiritual guide of the group.